A value priced line from a proven name in the ammunition industry. 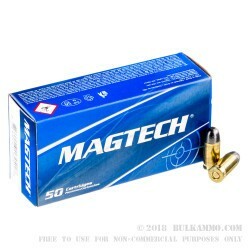 Magtech is offering a great pistol target round here in 95 grains to lessen the recoil slightly of the normally quite “snappy” .380 Auto. 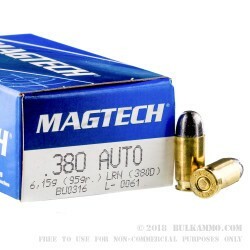 A super straightforward load, this features a lead round nosed bullet with a bit more velocity than most value priced brands, but with less overall recoil and offers a solid no frills experience at the range. The boxer primed brass is reloadable, offering another nice perk considering the low overall cost of the round. 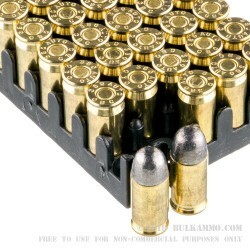 Note: this ammunition is probably best suited for firearms that have been broken in, and don’t have functionality issues due to ultra-tight tolerances or cleanliness. It is a bit smokier than some other options and can be a bit more to clean up. The all lead projectile can be a bit sticky in any firearm, and the .380 has a history of being quite picky. 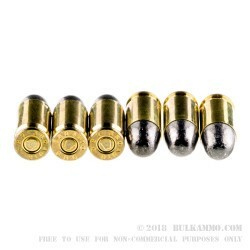 For those firearms that you shoot a lot and which have normal spring weights this will be an exceptional round and will offer a way to mitigate some of the uncomfortable recoil in small framed firearms shooting this round. Available with bulk ammunition discounts generally, to make this an excellent candidate for your “go-to” range choice.